PI006. 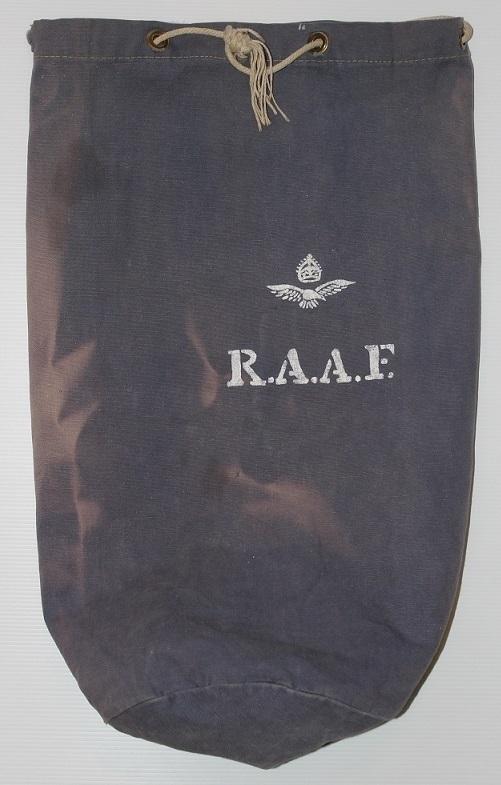 A blue kit bag stencilled in white with a eagle and crown RAAF 440434. Harold William Clark enlisted on 31 Dec 1943 at Brisbane and discharged with the rank of Flight Sergeant on 5 Feb 1946 from Air & Ground Radio School Ballarat. PI065. 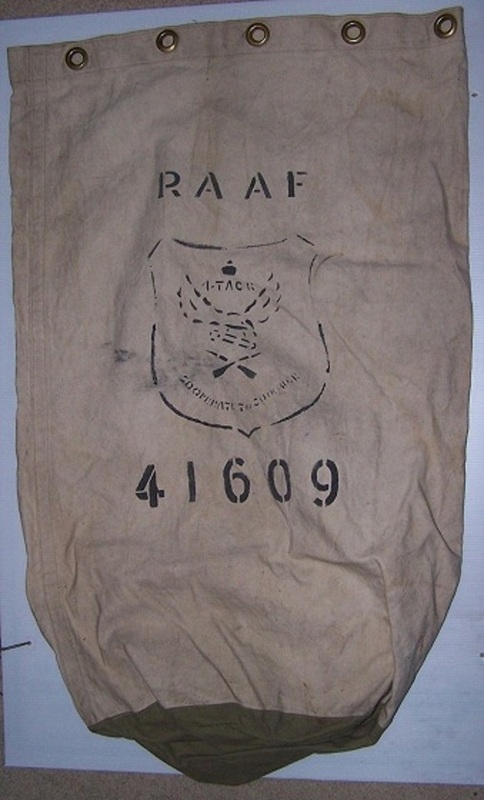 A white kit bag stencilled in black RAAF 4 Squadron TACR badge 41609. Arthur Desmond Elliott enlisted on 7 Jul 1941 at Melbourne and discharged with the rank of Warrant Officer on 4 Dec 1970 from Base Squadron Richmond. PI066. 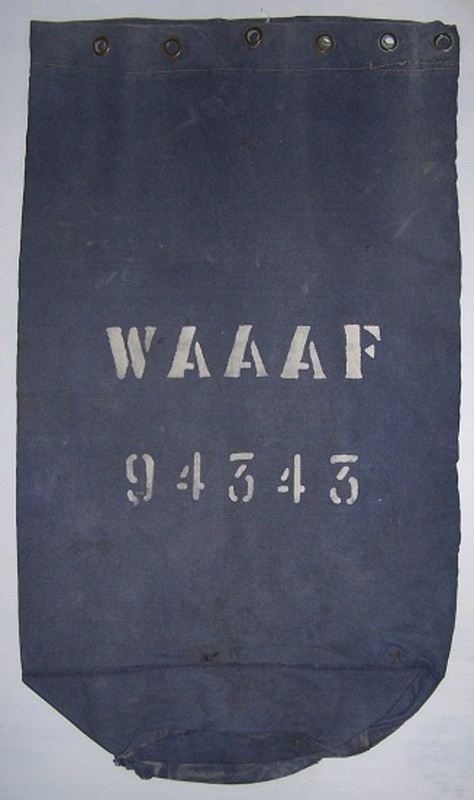 A blue kit bag stencilled in white “WAAAF 94343”. Dorothy Agnes Brandon Da Costa enlisted on 9 Mar 1942 at Brisbane and discharged with the rank of Corporal on 21 Nov 1945 from 5 Operational Training Unit. PI069. 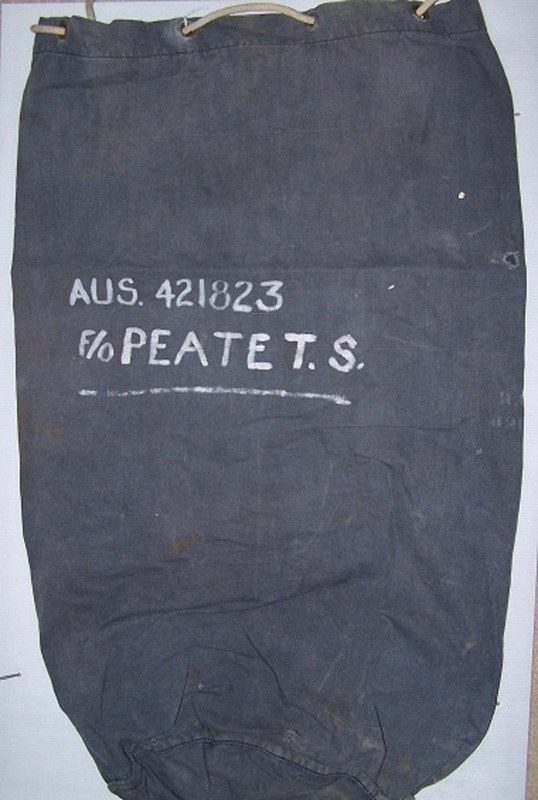 A blue kit bag stencilled in white “AUS 421823 F/O PEATE T. S. Thomas Seymore Peate enlisted on 28 Mar 1942 at Sydney and discharged with the rank of Flight Lieutenant on 19 Sep 1945 from 1 Operational Training Unit. PI070. 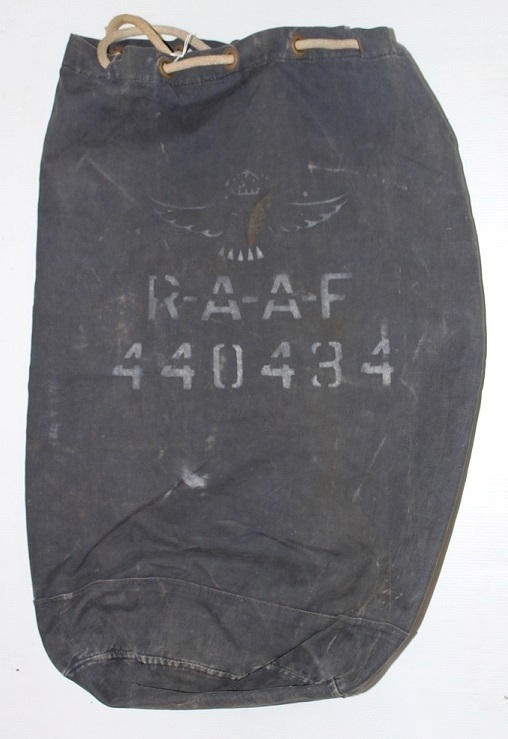 A black kit bag stencilled in white RAAF 137519. Cecil Smith enlisted on 1 Oct 1943 at Sydney and discharged with the rank of Leading Aircraftsman on 9 Apr 1946 from Headquarters North Western Area. PI072. 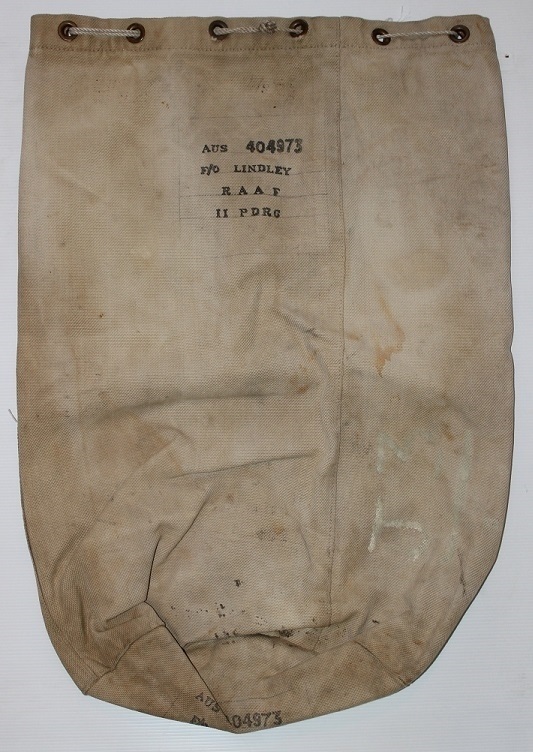 A white kit bag stencilled in black “AUS 404973 F/O LINDLEY RAAF 11 PDRG”. Ivan William Bray Lindley enlisted on 5 Jan 1941 at Brisbane and discharged with the rank of Flight Lieutenant on 7 Jan 1946 from 34 Squadron. PI073. 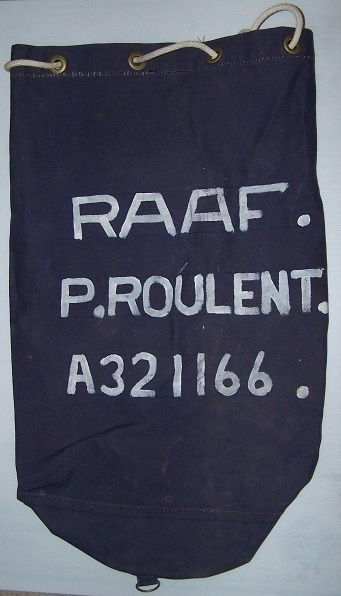 A dark blue kit bag stencilled in white “RAAF P. ROULENT A321166”. This kit bag is a post war issue. PI095. 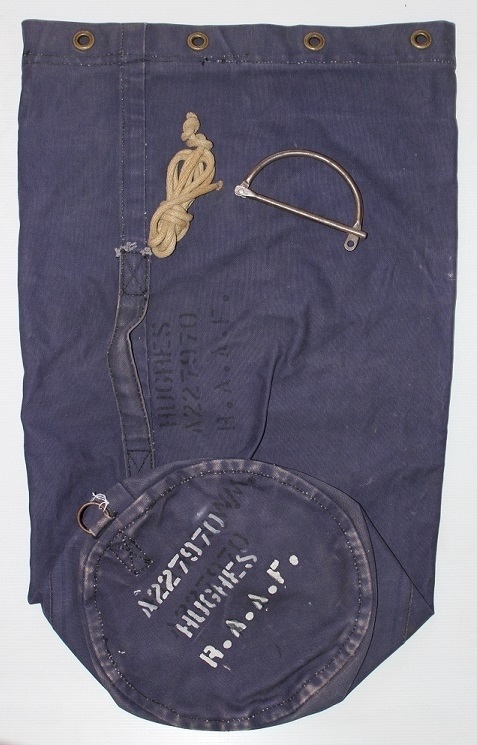 A dark blue kit bag stencilled in white “A227970 HUGHES R.A.A.F.” Stock code 8465-66-029-2588 is stencilled under the flap. Rope and D handle were found inside. This kit bag is a post war issue. PI104. 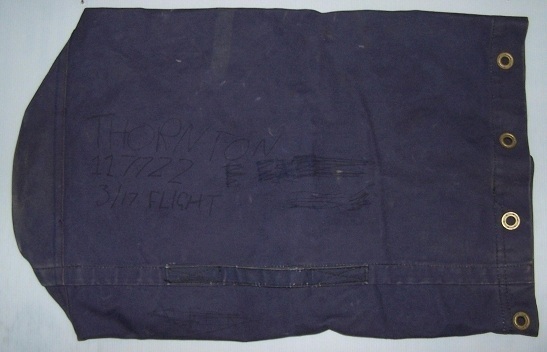 A dark blue kit bag and written in black marker is “THORNTON 117722 3/17 FLIGHT. Possibly Air Training Corps. PI120. 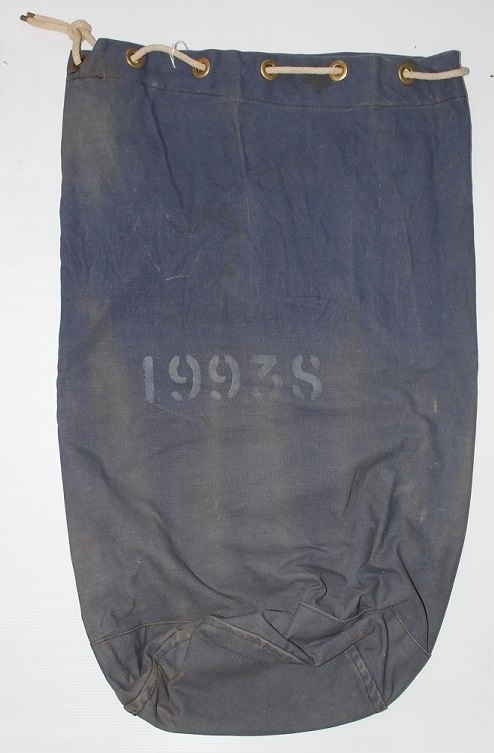 A blue kit bag stencilled in white RAAF with stylised wings 450183. John Daniel Cameron enlisted on 20 Jun 1944 at Melbourne and discharged with the rank of Leading Aircraftsman on 29 Apr 1946 from SAHQ Melbourne. PI122. 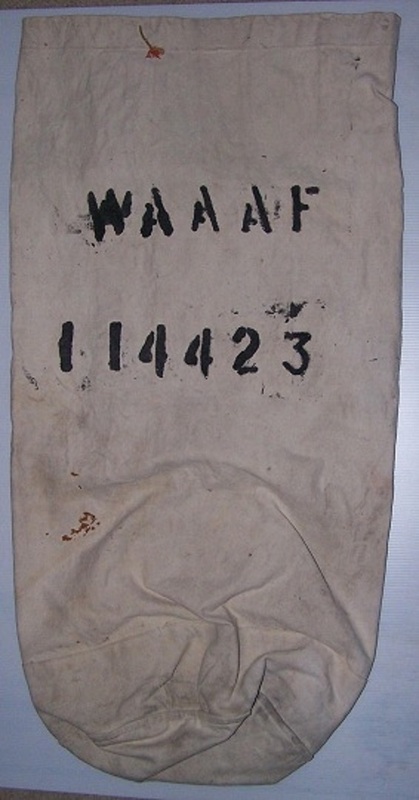 A white kit bag stencilled in black “WAAAF 114423”. Dorothy Vera Watson Williams enlisted on 26 Jun 1944 at Adelaide and discharged with the rank of Aircraftswoman on 18 Apr 1946 from NQS NEA. PI138. 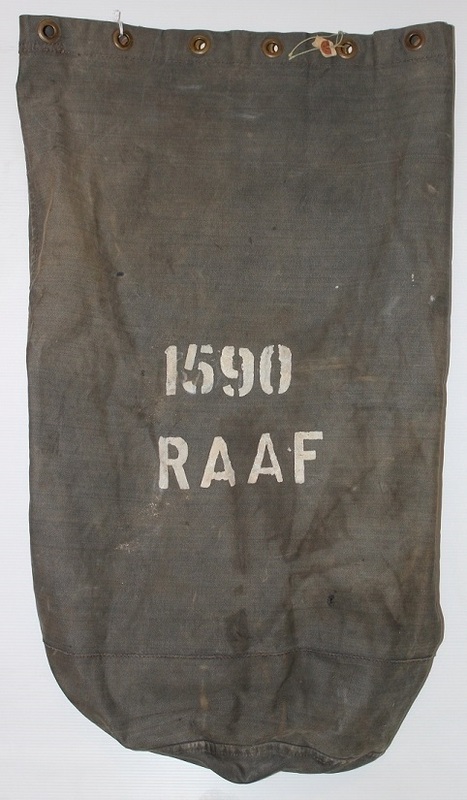 A black kit bag stencilled in white 1590 RAAF. There is no service record of that number. PI146. 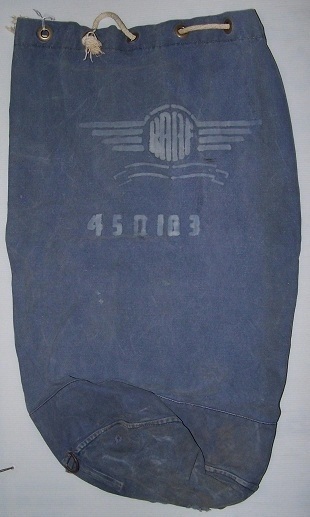 A small blue kit bag stencilled in white “EAGLE & CROWN over RAAF”. PI157. 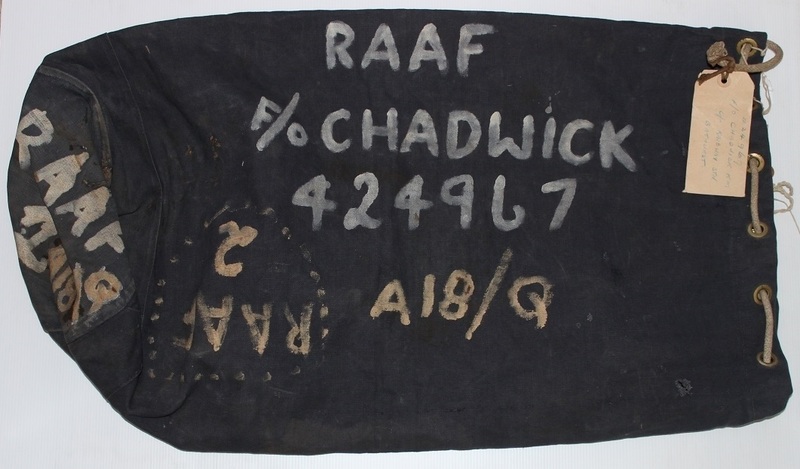 A black kit bag stencilled in white “RAAF F/O CHADWICK 424967 A18/Q”. Keith Neville Chadwick enlisted on 10 Oct 1942 at Sydney and discharged with the rank of Flying officer on 31 Jan 1946 from 14 Aircrew Holding Unit. PI158. 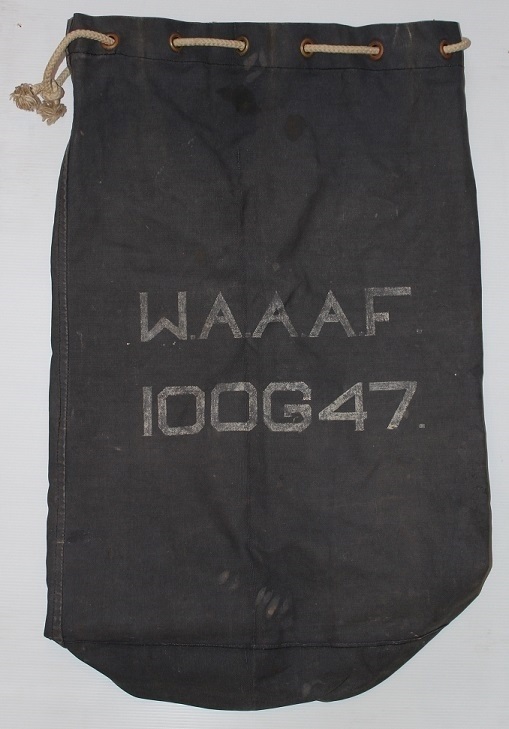 A black kit bag stencilled in white “WAAAF 100647”. Nancy Service enlisted on 28 Aug 1942 at Brisbane and discharged with the rank of Corporal on 28 Aug 1946 from Eastern Area Headquarters. PI160. 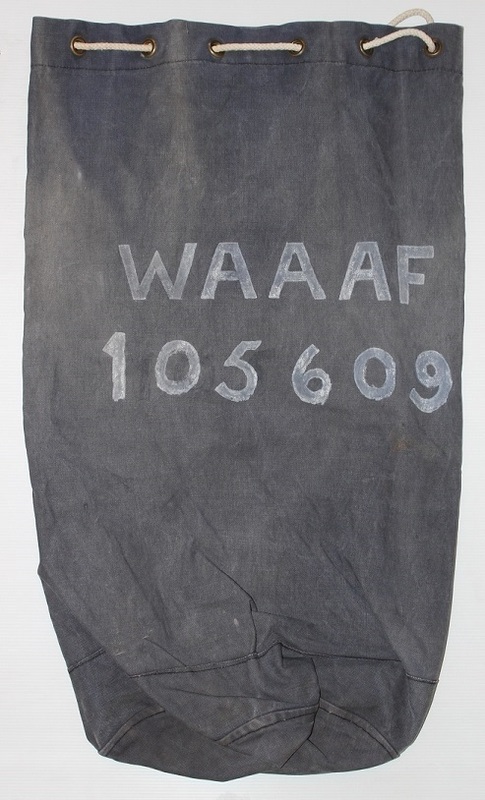 A blue kit bag stencilled in white “WAAAF 105609”. June Long enlisted on 6 Aug 1942 at Sydney and discharged with the rank of Aircraftswoman on 3 Apr 1946 from Station HQ Richmond. PI163. 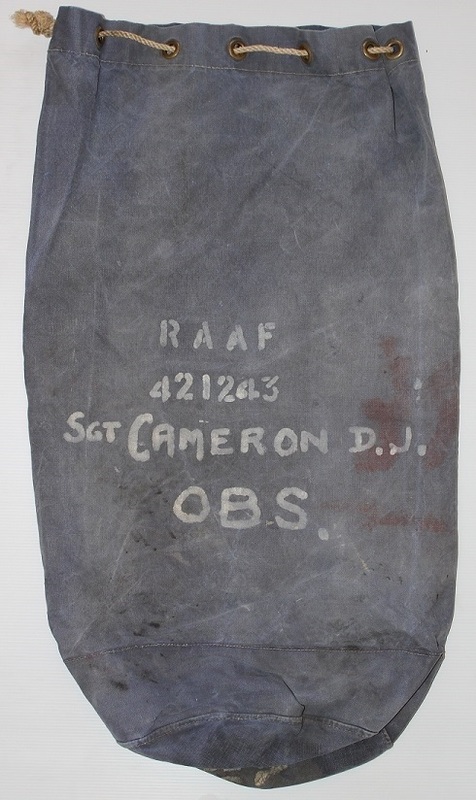 A blue kit bag stencilled in white “RAAF 421243 SGT CAMERON D. J. OBS” on the base is “RAAF No 2”. Douglas John Cameron enlisted on 31 Jan 1942 at Sydney and discharged with the rank of Warrant Officer on 19 Dec 1945 from RAF STATION BECCLES. PI167. 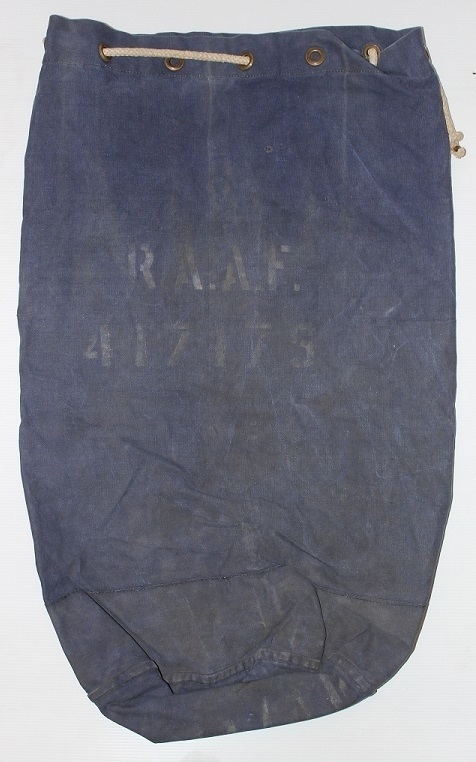 A blue kit bag stencilled in white “RAAF 417175”. Raymond Arnold Graetz enlisted on 31 Jan 1942 at Adelaide and discharged with the rank of Flight Lieutenant on 18 Sep 1946 from Central Gunnery School. PI168. 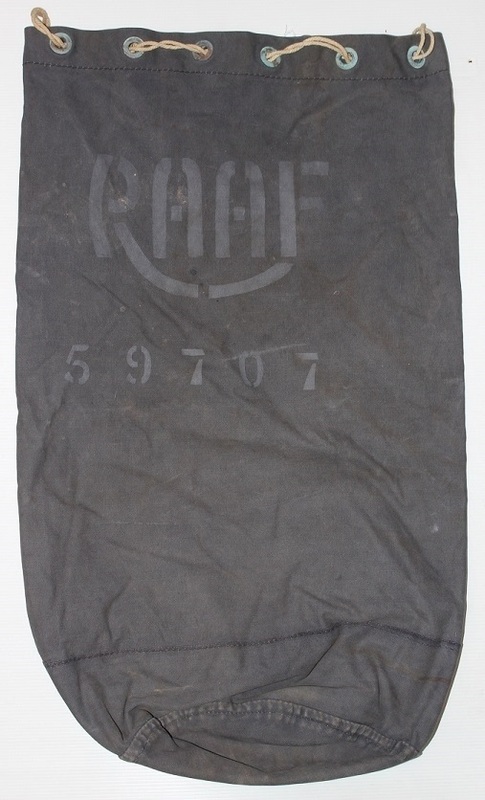 A black kit bag stencilled in white “RAAF 59707”. Noel Charles Belcher enlisted on 30 Jul 1942 at Melbourne and discharged with the rank of Leading Aircraftsman on 11 Mar 1946 from Air Force Headquarters. PI183. 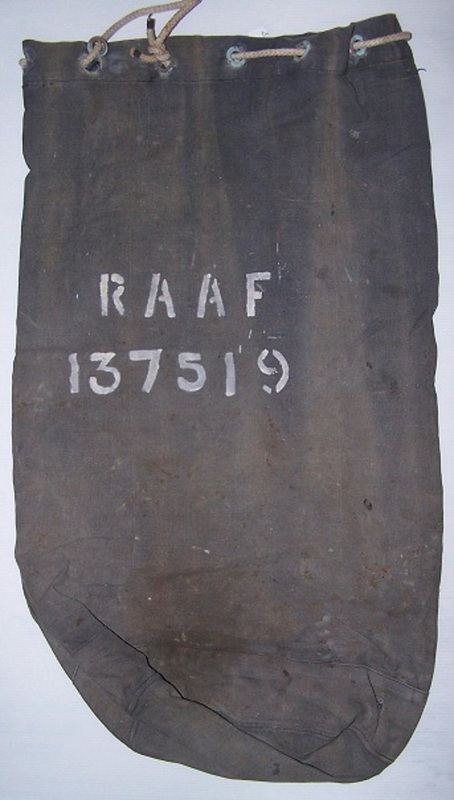 A black kit bag stencilled in white “RAAF 19938”. Joseph Ian McKee enlisted on 11 Dec 1940 at Melbourne and discharged with the rank of Leading Aircraftsman on 4 Dec 1944 from 1 Aircraft Depot.